At OML, we have quite a few embroidery machines here! They are all commercial embroidery machines that have many needles along with easy thread changes and automatic trimming. We have a Barudan 15 needle huge machine (aka Barry), a Happy 12 needle machine (aka Larry) and two twin Brother machines named Harry and Perry. We have quite a few needles in this place, to say the least.We have since decided that we needed a new addition to our embroidery machine library, and after much research, we have decided on a single needle home embroidery machine that is way more portable than the big guys! Here is our thought process of what we require in an embroidery machine, and how to get the right embroidery machine for our specific needs. We have done quite a bit of research, and we found out that some of the high end home embroidery machines are very expensive and still have the same basic functionality as other embroidery machines. The more expensive ones have bigger hoops and more bells and whistles. We have enough bells and whistles with the commercial machines – they have every detail that you could possibly want in a big machine. We don’t need bigger hoops- if we need something bigger than the Barudan’s huge hoop, we probably shouldn’t be embroidering it on anything, thats for sure. So hoop size is not an issue, and we don’t need to pay more for something we don’t need. We did however decided that a 4 x 4 hoop is just to small for what we wanted, so the large size of the hoop needs to be 5 x 7 ish or a bit bigger for the kind of work that we want to do. That is one of the keys to getting the right embroidery machine – get what you need, not necessarily what you think sounds good. 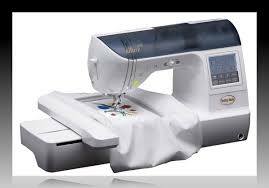 You have to do lots of research into the different kinds of machines, and the fat price tags that are attached to it. So pick the functions that you require, and make a list of those too. Your new machine will have to have these functions! Next thing to consider is connectivity of the machine to the computer and the network. Quite a few of the machines run only on cards. Well, that doesn’t work for us at all, we need to be able to attach a computer or at least have an easy to use USB. So we crossed off all of the machines that were card driven. Stitches per minute. For us this was a tough one – our big machines stitch 1300 stitches per minute or close to that, so we can’t expect a home embroidery machine to do a commercial level. We started looking at the different machines that we had left on our list of possibilities. While we are not expecting super fast, we were surprised that most of the machines did 400 stitches per minute. That is perhaps a bit to slow for us – it may be great for other people, but we thought we needed a little bit more. So we crossed those machines off of our list and went with a machine that stitched a healthy 650 stitches per minute. Not bad. Not bad at all. Portability: for us an issue was portability. We did not want a tiny machine, but we have plenty of big machines, so we didn’t want one too big, either. We settled for a medium sized machine that has enough weight and power to do the job at a higher SPM, but not too heavy. Its going to be nice to have an embroidery machine that we can actually move!! Price – some of the different machines are very similar, but have quite a bit of a difference in the price tag. We took this into consideration as well. We need to be comfortable with the price of the machine as well as feeling that we are getting the right level of functionality at the right price. So far, we felt we were getting a good price for the machine. New or used. For us, we definitely needed a new machine. We need to have a warranty, thats for sure. I am sure there is nothing wrong with used machines, they can be fixed up and be like new. But we wanted new. Repairs. We learned this one the hard way – getting a machine repaired is no easy task. In our town, there is no one near to us that will fix the machines, or even to do maintenance on them. So this was a big deal to take into consideration. Do we drive an hour to get a different brand of machine that is similar but less expensive? That means that we will have to drive an hour to drop off the machine and an hour back, and then do it all over again when the machine is fixed. So we crossed off those machines, and looked at what was in our city. There are a few places, but only one of them did in house repairs AND has 30 years experience fixing machines. Perfect. That is one worry off of our checklist. So in we went to the fabric store and began talking to the sales clerk. When we arrived, we knew around the price that we were happy to pay for the features that we needed. Nothing more, nothing less. We knew the features that we wanted, and the size and functionality of the machine that we wanted. 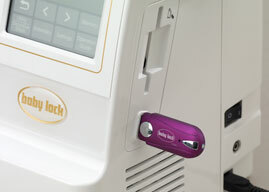 We told this all to the clerk, and they pointed us to the machine that filled every need for us: The Babylock Ellure Plus. We get it on Thursday, and we are very excited and confident that this was a great purchase for us, and we are excited to get our new machine.